It has a long history. LaSalle paddled here in 1681. Horse thieves and bank robbers liked to hide in the backwaters near the state line in the 1800’s. When they channelized the river in Indiana, they wanted to continue into Illinois, but were met with armed citizens to stop them, thus the river in Illinois is a pleasure to paddle. There are also a couple of odd laws that apply to the river. In Indiana, the Kankakee has been channelized and is boring (actually, double boring – a straight river and high banks) between Rt. 41 in Indiana and the state line. As you pass under the state line bridge, the river changes dramatically. I frequently paddle this stretch with my friend Don Browning. 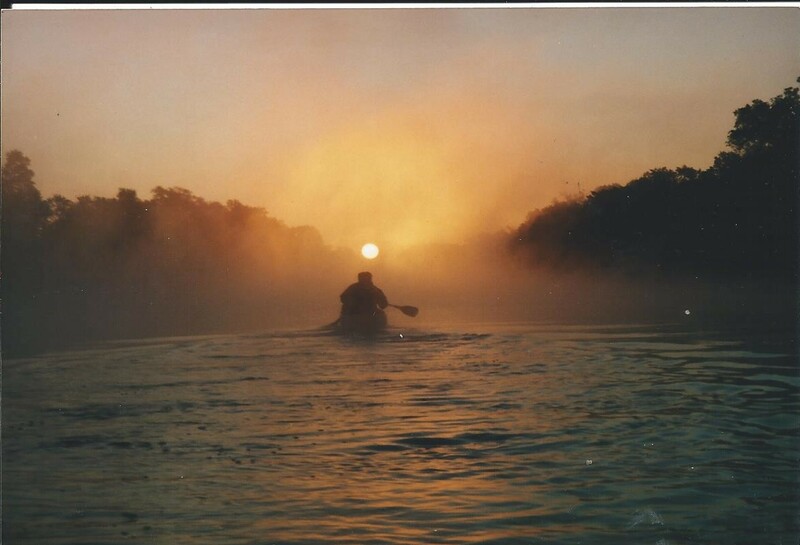 For a more interesting and challenging run, we sometimes paddle upstream and from Momence return when we are half-tired. Paddling upstream in good current presents a real challenge and takes teamwork as you try to find the right course around the bends. As soon as you pass under the state line bridge (closed to traffic, and duck your head going under the bridge), the river bends and curves and is lined with trees. In fast water, you have to be aware of possible flow-throughs; in lower water, its sandbars coming out from the bank. There are a few homes and cottages along the bank, but for the most part, it is pretty open with tree lined banks. There are some backwaters you can explore. Deer can be seen in the woods and beaver signs on the bank. At Momence, you take out to the right of the island; go to the left if you want to continue past the remains of a dam – pretty shallow, but not impossible with luck. Below Momence, the river slows as the dam in Kankakee backs up the water. Scenery changes in a subtle way. The banks are more open, but not populated. Watch for the swans below Rt. 17 – they are pretty and territorial. There is a small store in Aroma Park (interesting name) to stop for a soda pop. Past McQueen’s Landing, where the Iroquois River joins the Kankakee, you may run into power boats and jet skis. You see more homes along the bank. About a block above the dam, there is a small park river left to take out and portage. Continue on to Bird Park just downstream. From Bird Park to Werner Bridge (Kankakee State Park) is about 10 miles. This is the most popular canoe/kayak part of the river by far. High banks along some of this stretch make a change of scenery. Nice place for a leisurely cruise. From Warner Bridge to Wilmington you begin to see more civilization – a house, a farm. One morning just after we put in at the campground, we passed several islands covered with wild roses – breath-taking to say the least. At Wilmington, you go river right – under the highway (Rt. 53) – then either end your trip at the park or portage. This is an old mill race. Get out before the small dam. Walk to the tip of the island to continue – but be careful – fast and tricky water. The Des Plaines Conservation Area is river right after you pass under Rt. 55. The current becomes slower as you approach the confluence with the Des Plaines River. Paddle across the Illinois River above the dam for a take-out, with a rather steep bank. Walk along the bike path a hundred yards or so to the parking lot (McLinden Road off of Rt. 6) to get to the bike trail at Dresden (I&M Canal). Look across the road and you will see a barn used for the mules and horses when they pulled barges along the canal. Access points: Rt. 41 in Indiana; state line road (don’t know if I would leave my car here, as it is very secluded and poor parking); Momence north side of the river; just before Rt. 17 on road along the river; Aroma Park; Rt. 45 Kankakee; Bird Park in Kankakee; Werner Bridge (State Park, camping); Wilmington; Des Plaines Conservation area; I&M Canal in Desden. Reeds, in Kankakee, rents canoes, and there is a livery in Wilmington. I believe that Reeds has some camping areas not open to the general public. Hello Kevin, I would like to paddle with you from stateline down to Aroma Park. Let’s schedule a paddle.